Also it fits health and beauty industry, like dermatology clinic, cosmetology organization, skincare store, hair styling, nails care, plastic surgery, beauty clinic, hairstyling, cosmetic clinic, laser surgery, spa, wellness hospital, massage and beauty care, our new theme is a perfect option for you. 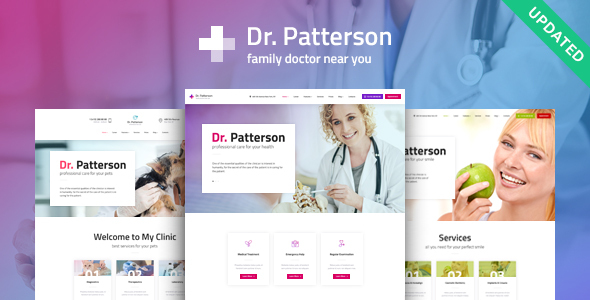 Dr.Patterson is made compatible with WPBakery Page Builder (aka Visual Composer, which we think is better than Elementor). The theme is an easy-to-use, modern, highly responsive and 100% Retina ready WordPress design that will present your services in the most effective way due the to built-in post types (Services, Testimonials, Team Members, etc), compatibility with such popular plugins as Slider Revolution (that immediately draws attention if installed as home slider), WP Bakery Page Builder (to build more unique page layouts), Booked Appointments (to arrange meetings with your patients), and many more.